Moose, one of our newest Facility Dog in action and saving lives! COPE Service Dog’s Dragon Boat Team paddles hard against the wind and rain this year! COPE Service Dogs participates in the 15th Annual Barrie Dragon Boat Festival. 15th Annual Barrie Dragon Boat Festival raising 1.75 million for charity. Podcast with Daisy the Hospice Simcoe Facility Dog. We had a barking good time on Friday, August 4, 2017, working with the organizers, trainers, and puppy fosters of C.O.P.E. Service Dogs as they celebrated the raising of their flag at City Hall. 'Canine Opportunity, People Empowerment', is currently engaged in a fundraising campaign so that they can finalize the training of seven new pups. For more information please visit http://copedogs.org .Special thanks to City Councillor Doug Shipley who came out to represent The City of Barrie . Shelby loves her BIG MAC (COPE Service Dog), at Barrie City Hall August 4, 2017. COPE Service Dogs at Barrie City Hall August 4, 2017. COPE Service Dogs Dollar-A-Day Campaign on Barrie CTV news July 31, 2017. 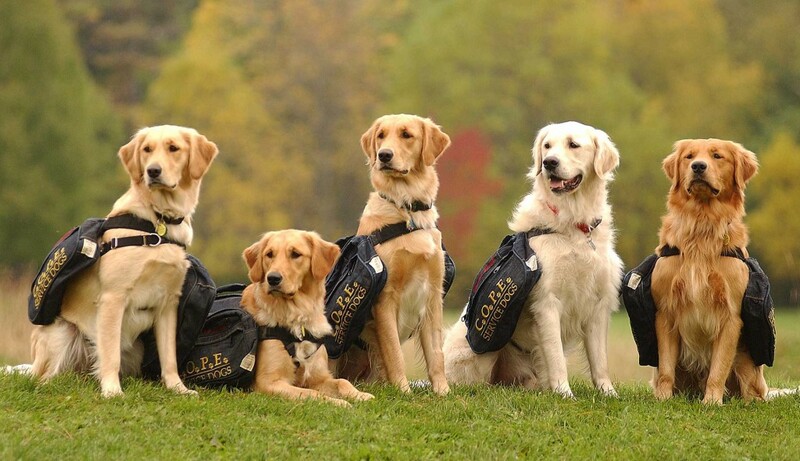 These dogs are used to delivering help, but now they need yours!